A lot has happened since we last checked in with Justice League. The Anti-Monitor and Darkseid fought, Darkseid died, we met the New 52 versions of Mister Miracle and Big Barda, and various members of the League were made “Justice Gods.” Batman is the God of Knowledge (and has the Mobius Chair), Superman is the God of Strength, and Shazam is the friggin’ God of Gods! So yeah, they’re not quite themselves. Cases in point: Batman and Green Lantern are hanging out at Ace Chemicals, and Superman is trying to kill Wonder Woman. Meanwhile, Cyborg, Power Ring, Mister Miracle, and Big Barda look for answers about The Anti-Monitor from the remaining members of the Crime Syndicate of America. But a very unwelcome surprise awaits them. Jason Fabok is back on the pencil this issue after being absent for issues #45 and #46, tagging out to the awesome Francis Manapul. I’m a big Manapul fan, but this is Fabok’s story. Fabok cites Jim Lee as an influence, and that influence is evident in his work. Like Lee (who coincidentally started this series), Fabok’s art has a certain epic feel to it, which obviously makes him a great fit for this story in particular. But Fabok’s art also adds weight to quieter moments, such as the Batman/Green Lantern moment we open this issue with. 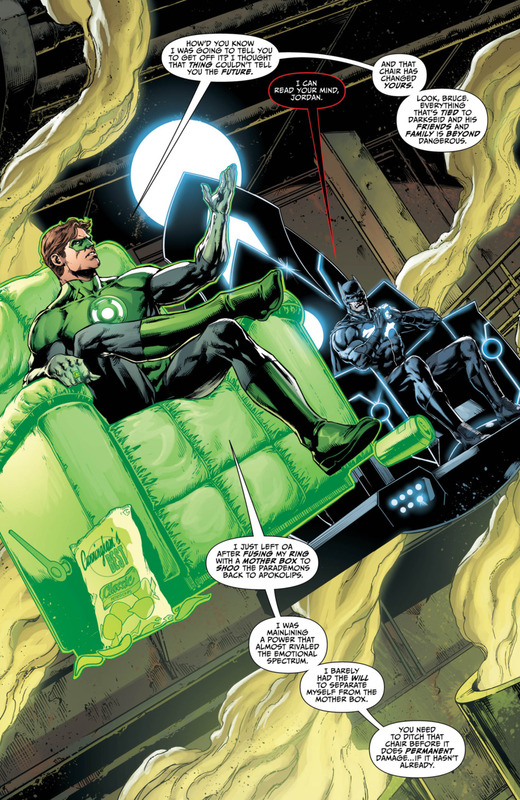 Granted, the subject matter helps: Batman in the Mobius Chair, inside the chemical plant where the Joker originated. 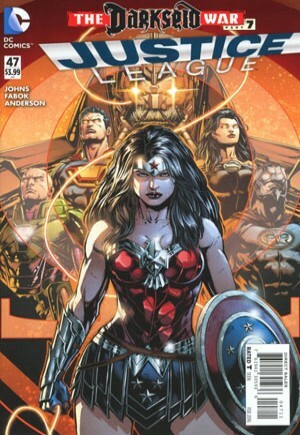 But Fabok is having a great run on Justice League, really making the most of this opportunity. I do have one question, though. Can Green Lantern actually eat the chips in that construct (shown above)? The early solicitations for Darkseid War indicated this event has been in the works since the first issue. Considering what we get in this issue, combined with Johns’ track record on books like Green Lantern, I believe it. This story has touched on much of the continuity the book has established, i.e. Darkseid, Lex Luthor as a member of the Justice League, and now the Crime Syndicate. I wasn’t a huge fan of Forever Evil, but it’s interesting to see these altered versions of the characters. Ultraman’s brief scene with Mister Miracle is interesting, as his body is withered away, and he’s become more of a cowardly weakling. Certainly a stark contrast to how he was when we last saw him. It’s evident the Syndicate will be playing a major role going forward. That’s a risky move, considering how crowded this story already is. But the Syndicate’s presence does have the potential up the epic factor Darkseid War is going for. And with some help from Power Ring, we do see the return of a Syndicate character I’m very happy to have back. So it’s worth a shot. I’m very grateful this book hasn’t been effected by events outside it’s own pages. For instance, we don’t have the Jim Gordon Batman, Wonder Woman doesn’t have the gaudy David Finch costume, Superman has his costume and all his powers, etc. This is a Justice League worth of something like Darkseid War. This story seems to get bigger and bigger with each passing month. In addition to all the Justice League issues, we had the various character one-shots (most of which I skipped). A double-sized Justice League Darkseid War Special is also solicited for February. At this rate, I wouldn’t be at all surprised if some sort of Crime Syndicate special also gets released. Clearly Johns needs a lot of canvas to paint his latest masterpiece. Which is fine, as long as its worth it in the end. If this issue is any indication, that is indeed the case. Image 1 from inside pulse.com. Image 2 from comicvinecom. This entry was posted in Comic Books/Graphic Novels and tagged Batman, comic book reviews, comic books, Crime Syndicate of America, DC Comics, Francis Manapul, Geoff Johns, Grail (DC Comics), Green Lantern, Hal Jordan, Jason Fabok, Jim Lee, Justice League #47 (2015), Justice League: Darkseid War, Lasso of Truth, Mister Miracle, Rob Siebert, single issue reviews, Superman, Superwoman, The Anti-Monitor, Ultraman (DC Comics), Wonder Woman on 01/02/2016 by primaryignition.